This install/uninstall instructions are applicable to the Fedora/RedHat Linux platform. The CentOS Linux is used as an example. 1. Go to the R-Studio for Linux download page. 2. Select the x86 or 64-bit version and click the button, download the RStudio3_i386.rpm or RStudio3_x64.rpm file, and double-click it. 3. Click the Install button on the Do you want to install this file? message. 4. Wait for the installation process to finish. 1. 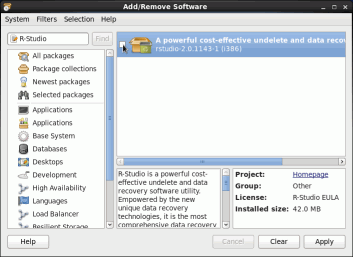 Start Add/Remove Software, find R-Studio, clear the checkbox, and click the Apply button. 2. Click the Remove button on the message and wait for the removal process to finish.